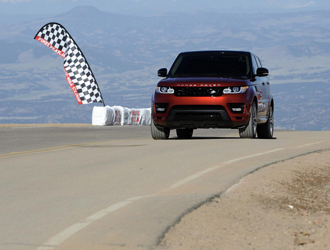 The Pikes Peak course starts at more than 9000ft above sea level, rising to more than 14,000ft at the finish. The 503bhp Supercharged Range Rover Sport had a roll cage and a multi-point harness for the driver fitted, but was otherwise standard showroom spec. Dallenbach's time also eclipses Rod Millen's production car record, set in 1989 with a Mazda MX-6, by more than eight seconds - but that was set when the 156-corner course included loose dirt sections. It's now all-tarmac, so the two aren't really comparable.